Immune system has capacity to recognize and elicit response to antigen not encountered before.The immune system relies onclonal diversification i.e. the production of T and B lymphocytes with all possible receptors for antigens.The lymphoid stem cells undergo proliferation and differentiation thus generating immunocompetent T cells in thymus and immunocompetent B cells in bone marrow. Each immunocompetent T or B lymphocyte can identify only one particular antigen, however, the sum of the population of lymphocyte specificities may represent millions of foreign antigens.The lymphocytes remain naïve and dormant until encounter with foreign antigen.The immunocompetent cells enter the circulation and encounter foreign antigen in secondary lymphoid organs. The epitope of foreign antigen interacts with specific naïve B or T lymphocytes (those having antigen specific receptors) and stimulates B or T lymphocytes resulting in multiplication of cell population (i.e. clonal expansion)with antigenic specificity as that of parent cell. This B or T cell proliferation (cell expansion) and differentiation into effector cells and memory cells in response to interaction with foreign antigen is called clonal selection as depicted in Figure A.It is called so because it is the antigen that selects the characteristics of clones of B cells that proliferate and specializes after exposure to antigen. Antigen-presenting cells (APCs), helper T cells, and immunocompetent T and B cells interact with each other in many ways resulting in active cellular immunity or humoral immunity, or both. Immunological memory is a central feature of the vertebrate and invertebrate immune systems.It is the ability of immune system toremember, identity the pathogen and respond more rapidly and effectively to a pathogen that has been encountered earlier. Immunological memory provides protection from subsequent infections and forms the basis of natural immunity against diseases. 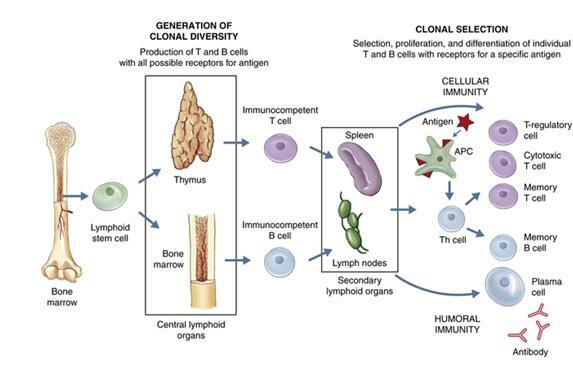 The phenomenon of clonal selection results in immunological memory.Clonal selection brings about amplification and differentiation of antigen specific lymphocytes into effector cells and memory cells. Memory cells live longer (for decades and even lifetime) as compared to lymphocytesfrom which they originated.The first time interaction of dormant lymphocyte with an antigen generates primary immune response. The subsequent encounter of host with same antigenwill elicit a quicker and more robust secondary response because of increased number of memory cells. The dormant B cell from the bone marrow with membrane bound antibodies on surface with specificity for one particular antigen are activated upon interaction with that specific antigen.Dormant B cells eventually die unless they are stimulated and differentiated by antigen and helper T cells. Interaction of antigen with B cells having antigen specific receptors result in activation, proliferation and differentiation of naïve B cells resulting in generation of antibody producing plasma cells (effector cells) and memory B lymphocytes. Memory cells thus formed stay in the G0 phase of life cycle unless activated by antigen. Primary response is not immediate, there is a lag of 5-7 daysbefore the antibody level goes up, this time corresponds to the time required for clonal selection by antigen during first encounter. 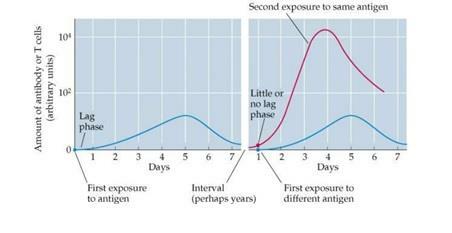 However, secondary response is immediate (lag 0-2 days), more intense (higher antibody levels) and effective for more time (see Figure B).Antibody titer reach its maximum after 2 weeks and declines as effector cells undergo apoptosis. The secondary response reflects the activityof the clonally expanded population of memory B cells. This robust immune response is a consequence of greater number of memory cells and ability of memory cells to quickly respond to antigen encountered before. Moreover, affinity maturation and class switching that occur during B cell activation result in antibodies of higher affinity and different isotypes thus generating vigorous secondary response. The interaction of an antigen-MHC complex with immunocompetent T cell leads to proliferation and differentiation intoeffector T cells (cytotoxic T cells, CTLs and T helper cells, TH cells) and memory T cells. This can be illustrated with example of graft rejection. When a piece of skin from one miceof strain 2 is grafted onto another mice of strain 1, the graft does well initially.owHoweverHowever, the graft is rejected after 10-14 days. This is first set rejection. Thereafter, skin from strain 2 mouse is grafted onto strain 1 mice and skin from strain 3 mice is grafted onto strain 1 mice. The strain 2 skin is rejected in less than a week while strain 3 skin is rejected in 10-14 days.Immune response to graft is specific. The rapid and vigorous secondary response is due to increased memory helper T cells and cytotoxic T cells. The successful clinical applications of immunological memory are vaccines. Vaccines induce artificial immunologicalmemory by introducing antigen in weakened or killed form to stimulate an immune response and thus prevent disease. Therefore immunological memory forms the basis of natural as well as artificial immunity. Immunological memory is characteristic of adaptive immune response. Antibodies and T cell receptors are responsible for specificity of immune system.